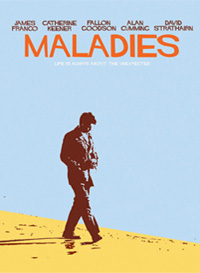 Maladies is a strange, odd, and very indie movie set in 1960s New York (that often crosses over into the contrived realm). The method actor craft and quirky characters (with plenty of inner demons) get well exercised, as the viewer follows James, a young (retired) actor along his rambling daily life, living with his sister and their friend (both pretty odd themselves). Attempting to redirect his creativity into writing, his sometimes incoherent digressions lead towards his systematic disintegration. Some of the other peripheral characters include an obsessed gay neighbour, who is dying to read the incomplete writing (in between his mental episodes). The tale is narrated throughout by an authoritative voice, which is also the one in his head with which he often has a dialogue. The (pretentiously single named) director, multi-media artist Carter only made one previous movie, another Franco vehicle: Erased James Franco. This is the kind of arty, out there movie that will never be a commercial hit, but rather acts as expression for the makers to satisfy their craft amid the bread and butter projects they need to do. Fans of Franco’s more commercial work, unaware of his arty output, may not enjoy this.